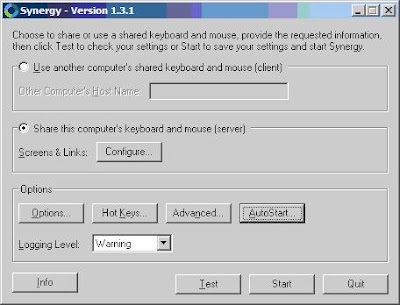 If you have multiple computers and you would to share a single mouse and single keyboard, synergy is the best software that you can use. The amazing part of this software is, they can share a single mouse and keyboard from a different operating system because the sharing goes through the TCP/IP. I've personally used it between windows and Linux machine. Wow! I just love it! You can download Synergy software from sourceforge.net. Click on the download link on that page and click the binaries package. In the binaries package page, the *.rpm is for Linux system and *.tar.gz is for the rest of the Unix system which doesn’t run on Intel’s x386 architecture. The *.exe is for windows platform. Once you have installed Synergy, you need to configure your machine to act as a server. Usually the one in the center acts as an server and the machine besides it act as client. 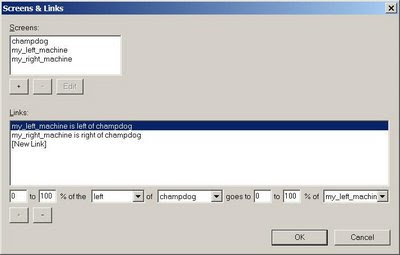 You will see this configuration screen and click on the “Configure…” to configure your machine on your left and right. First, you need to add all the machines into the list and click on the "[New Link]" to configure how do we want to link all these machines together. Try to play around with the UI and you should be able to get it. The "+" is to add into the list and "-" is to remove from the list. Once the server is configured, just click the “Start” button to start the server. Then the next thing to do is to install the synergy in your client’s machine (e.g. your machines on your left and right) and connects them to this server. I love this software because I can have 3 monitors in front me (each monitor is from different machine or even different operating system) and I can control them using only one mouse and one keyboard. Cool, isn't it? 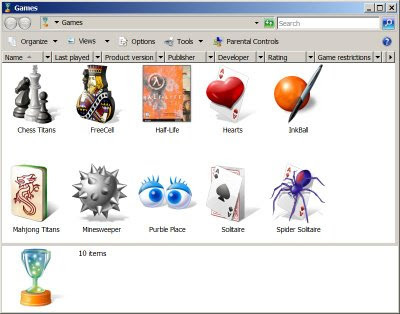 Games explorer automatically adds a link to each game that you have installed. If some games those don’t appear in the Games Explorer, you can just drag and drop the game shortcut. Do you think that is useful or necessary?